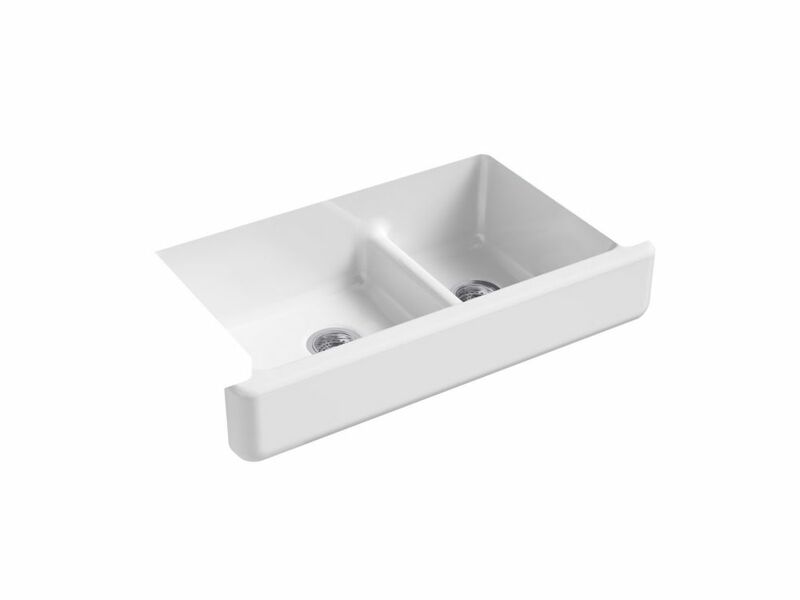 Whitehaven Undermount Cast Iron 35.5 inch 0-Hole Double Bowl Kitchen Sink In White The Whitehaven apron-front kitchen sink features a streamlined and versatile farmhouse style to complement any decor. Perfect for remodeling projects, it has a shortened apron that allows for installation on most new or existing 36-inch standard cabinetry. The Self-Trimming(R) design requires only a simple rough cut, overlapping the cabinet face for beautiful results and easy installation. A low barrier divides the two compartments, making it easy to wash and rinse large items while still keeping the two basins separate. Crafted from enameled cast iron, this sink resists chipping, cracking, or burning for years of beauty and reliable performance. Whitehaven Undermount Cast Iron 35.5 inch 0-Hole Double Bowl Kitchen Sink In White is rated 4.9 out of 5 by 16. Rated 5 out of 5 by Rhonda from This sink is absolutely gorgeous. Install when smoothly. ... This sink is absolutely gorgeous. Install when smoothly. It completes our kitchen refresh perfectly.Love it. Rated 5 out of 5 by Kim from Gorgeous sink!! Well worth it! ... Gorgeous sink!! Well worth it! Rated 5 out of 5 by JR from I have had this sink for aprox.2 months. I love it. I love the white as apposed to the stainless ... I have had this sink for aprox.2 months. I love it. I love the white as apposed to the stainless steal sinks I've had for 30+ years/ it's much more classy looking. I some times get some scratches on it (most come right out) but i want to purchase a "sink saddle" to cover the middle piece. its been difficult to find pieces for this particular sink ? I need to call customer service I think? Rated 5 out of 5 by Susan from The Short Apron Front Sink was perfect for an existing... The Short Apron Front Sink was perfect for an existing kitchen cabinet. Very pleased how all worked out. Rated 5 out of 5 by Dan from Great sink!!! Installation was easy. Kohler really did... Great sink!!! Installation was easy. Kohler really did a great job with this apron sink to fit perfectly into existing cabinets. If you are renovating your kitchen and what an apron sink, you can't go wrong with this sink!!! Rated 5 out of 5 by Trevor from Sink looks great and fit without any modifications to... Sink looks great and fit without any modifications to the cabinets.